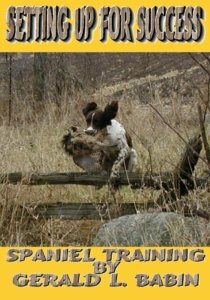 This highly acclaimed training manual will take you and your Spaniel on a journey from that sock chewing puppy to a wonderful hunting dog that you will be proud of. I couldn’t explain it any better than Mr. Bill Cosgrove of Ivanhoe Kennels. "This is a very well done, easy to follow, step - by - step of developing a pup all way up to field trials. Of course hunters and hunt test enthusiasts will benefit greatly from Mr. Babin's careful instructions and video demonstrations." "The sequential approach is the right one, and Mr. Babin gives tips on how to avoid problems and confusion in your dog; as he takes you through the progressions." "I have pretty much seen and read everything out there and I would put this product right at the top of your list of required reading." "His videos are really well done. A great tool for newbie's and puppy owner's starting out. It is like a training manual with illustrations that - when you click them; become short video clips." "Another thing is he gets into trialing - which is a subject that a lot of other books and video talk down." The last two chapters describe the inner workings of a field trial and explain what judges are looking for. Judging score sheets are broke down item by item and I explain exactly what a judge is looking for and how to train to that end. You will find tips, tricks and tactics that will help you achieve some of those seemingly impossible tasks. Marty Knibbs is one of the most respected Spaniel trainer and handler in North America. "What a project you undertook here. This will really help interest people and certainly will create good trained companions/ hunting dogs and competitive trial dogs. There is nothing I have read or seen out there like this. Thanks for letting me take a look." Setting Up For Success is a PDF file that will be downloaded and stored onto any of your devices.